Breakfast, Lunch, Dinner and Tea/Coffee. A 2 hour evening safari in the jungles of Mudumalai. Free Use of all Indoor and Outdoor Games. Children below 3 years are complementary. Blue Valley Jungle Resorts, spread invitingly over 32 sq. km. of Asia's thickest forest at Madhumalai (Theppakadu), snuggling cozily at the foot hills of the highest peaks of those incredible Blue Hills known as the Nilgiris in South India. Blue Valley Jungle Resorts offers you eco-friendly accommodation in the form of cottages and deluxe rooms. 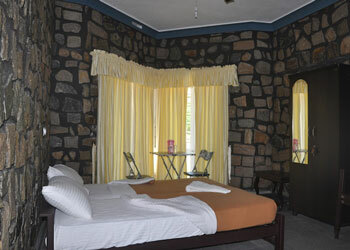 The accommodation at Jungle Resorts aim is to deliver comfort matching customers need. Blue Valley has a restaurant, bar, indoor & outdoor game facility including children's park and tennis courts, and a travel desk. Bird watching, Riverside picnic and Temple visit.